The leadership of the ACR is dedicated to ensuring the success of the mission of the ACR. The College’s leadership aims to collectively lead the field of radiology into the future. The BOC implements programs and activities to accomplish policy goals through commissions, committees and special task forces. The Executive Committee carries out the business of the College between regular meetings of the Board of Chancellors. The Council meets annually to establish policy, and facilitates communication with state chapters and with the BOC. The CSC oversees Council activities. Together with the Council, the CSC facilitates communication with state chapters and with the BOC. ACR commissions and committees report to the Board of Chancellors and reflect the operational activities of the College. How Does the ACR Work? With so many initiatives going on at once, the College needs a well-defined, streamlined structure that is well representative of its diverse constituency. 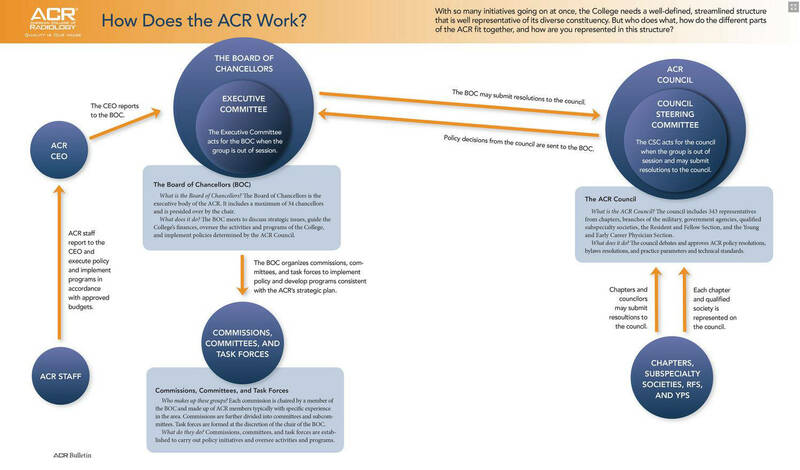 But who does what, how do the different parts of the ACR fit together, and how are you represented in this structure?